The energy of the music, the depth of the lyrics and the need for positive vibrations, called Juliana Sealy aka Lady Virtue to reggae music. A native of Barbados, known as the land of flying fish and cou cou, the brown pelican and the peacock flower, this multitalented musician wants to instil her virtue into reggae music With a desire is to deliver quality music, with purposeful content and solid messages; Lady Virtue, has therefore chosen to embody the positive vibe and conscious theme in her music. A mantra pledged by her since singing in the choir at her Secondary School. Lady Virtue was destined to have a musical career, having grown up in a home where Reggae and Gospel music blared loudly from the radio on Sundays. Lovindeer, Bob Marley, DJ Tiger, Tracy Chapman and Buju Banton soon became forces of influence as she embarked on her musical journey. “I started singing in my mother’s womb, so I am just continuing my journey. I was so shy, sometimes I still am, but the music has given my personality an outlet to shine”. Singing hymns on her secondary school choir tuned her vocals and prepared her for the rigours of the music industry. Confident that she was born to do music, Lady Virtue began her career striving to extend her musical influence across the Caribbean and the World. In order to ensure a smooth transition into the world of music, while a teenager, she became a DJ, gaining more experience as she toured Barbados playing on the JR Super-Sounds Sound System. Although she enjoyed working with the sound system, she was ready to move on to the next step – “It was a wonderful experience playing at fetes and parties but everything is for a while as people have to grow and it was always my dream to be in music as an artist, and after a while I just got more involved in music, to the point where in 2001 I started doing calypso”. Her first original song Lay Lay Man, launched her into spotlight and the music business started to pay attention to this serious artiste. On the heels of the success of her debut single, she released two calypso albums - Julie on the Rise in 2002 and Julie Releasing the Power in 2004. Tracks from both albums received regular rotation on the Barbadian airwaves. While performing and excelling at Calypso, Lady Virtue could not turn her back on her first love, Reggae; and went on to release Reggae singles: Find A Good Man, Life Is A Gift, The Only One For Me and Sugar In My Cup an ode to her love for Reggae music. 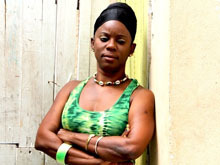 After releasing her first reggae song (Find a Good Man), the Bajan musician began working with Jamaican producers and her subsequent decision to come to the island of Reggae music seemed a natural progression in Lady Virtue’s career as she embarked on a path to focus on the genre – “I choose to work with Jamaican producers because you don't pick apples from a mango tree”. Nothing will hinder the song-writer, she is focused, determined and convinced that she will be successful on local and overseas markets as a Reggae artiste - “I am self-motivated. I want it, I go after it. But I seek my inspiration from God and he guides me… ‘Where God guides he provides’ ". Armed with skills on the turntable, skills in writing, and skills on the microphone, Lady Virtue is singing her way to the top. She has been doing work with both Jamaican and Barbadian producers to ensure that her positive messages are heard across the Caribbean and the world. Lady Virtue’s latest release: Tek Di Pressure Off, featuring internationally renowned Jamaican Reggae artiste, Luciano and produced by Rick ‘Jamplified’ Warren of Jamplified Records, is already receiving rotation on the airwaves in Jamaica “The idea for the song came about after I saw how people were living in my country and the struggles at hand, not only in Barbados but all over the Caribbean and knowing that at the end of the day it’s the politicians who can really take the pressure off. Working with Luciano came about because of the type of song and seeing he is the poor people defender, this song was right up his street. He was the right man for the job”. Lady Virtue will not be stopped and remarks that she is putting in the groundwork now for an even brighter future in the music business. “With everything one should go from strength to strength and that's my intention so within the coming years I expect to keep bringing music that people can relate to. If a song can relate to your situation and help in some way then I feel I have achieved my goal. I will be the voice of the people”.